Fear the Walking Dead hits us with a hurricane, a whole lot of filler, and a long expected reconciliation. Close Your Eyes has Alicia (Alycia Debnam-Carey) riding out the storm, drumroll please, with Charlie (Alexa Nisenson). It's extremely contrived to have these two characters randomly meet up, but that's par for the course in the zombie apocalypse. There's a decent dramatic turn as Alicia struggles with her hatred for the girl that destroyed her family. We get no updates about the other characters, meaning the storm storyline will be milked from their perspectives. Close Your Eyes begins with Alicia finding a house to escape the storm. She goes through it, casually dispatching the four walkers she finds inside. Alicia dumps their bodies in the front yard. But the pictures of the family on the walls bothers her. She collects the pics, puts them in a box, then unceremoniously drops them by the deceased owners. Alicia hears a noise coming from upstairs. She goes into a room. A walker has been impaled by a tree off the deck. But that's not what she's hearing. Alicia calls out a warning, she'll kill who's hiding if they don't come out immediately. She rips open the closet door. Charlie comes rushing out. Alicia is stunned. She throws the girl to the ground. Alicia screams if Charlie is following her. Why is she here? Charlie is terrified, but silent. Alicia runs downstairs. She grabs her gear, the car key, then goes outside to leave. The wind is fierce. She struggles to open the car door. She yanks it open, but falls over and knocks herself out. Alicia awakens in the house. Charlie has obviously saved her. She runs upstairs to the closed room. She curses Charlie for her actions. She screams how Nick died in pain, aware that Charlie had shot him. She doesn't know if she can stop herself from killing Charlie. Charlie cries on the bed. She takes out the gun that killed Nick. She approaches the door as Alicia continues to yell. Alicia wishes Charlie a long life. She wants Charlie to suffer with the memory of her betrayals. Charlie continues to weep. Alicia goes downstairs. The wind is banging the shutters loudly against the windows. Alicia finds a hammer and nails in the basement. She goes outside to hammer them shut, but cannot hold them down against the wind. She goes upstairs and screams for Charlie to help. They both try to secure the shutters, but the noise has attracted a slew of walkers. They race into the house as the walkers crowd the windows. Nailing the front door shut. Alicia wants to start a fire. She tells Charlie to hand over her wet coat. The girl is still silent, standing still. Alicia rips off Charlie's wet jacket. In the pocket, she finds the gun that killed Nick. Alicia asks her if she'd planned to kill her too. Charlie continues to cry, then runs upstairs. Charlie opens the window. She walks on the deck toward the impaled walker. Alicia is trying to start the fire. She feels the wind from upstairs. Alicia pulls Charlie back before the walker can grab her. Alicia sees the family's pictures she put outside on the floor. Charlie brought them in and dried them. Alicia tells Charlie it's time to eat. Downstairs at the dinner table. Alicia wonders if the gun was for Charlie to commit suicide. She won't let Charlie do it. She wants her to suffer for her actions. Alicia warms up canned beans on the fire. They eat by candlelight. Charlie speaks for the first time. She asks Alicia if she lived by the beach in California. Alicia says no, why does she care? Charlie has never been to the beach. She was supposed to go to the Galveston beach with her parents. Upstairs, Alicia rebukes Charlie for the pictures. This family is dead. No one is coming to find them. No one cares. Charlie cries bitterly. As they argue, the windows in the house break. The walkers are blown off the porch. The entire house begins to shake. Alicia grabs Charlie. They race into the basement, which is flooded with water. The door to the basement caves in. They are trapped as the water continues to rise. Alicia tries to open the storm cellar door, but it's chained from the outside. They stand on containers as the water comes to their chests. Charlie cries, she doesn't want to die. She cannot turn like her parents. She admits she cannot remember their faces. Charlie pleads for Alicia to kill her. As Alicia puts the gun to Charlie's head, she has flashbacks of her mother and Nick. She can't pull the trigger. They embrace each other as the water rushes higher. Suddenly the storm cellar door is smashed loose. They swim towards it and escape outside. As the storm wanes, they realize that the tree with the impaled walker had collapsed; breaking the chains. Alicia shoots the walker in the head. The next day the storm has passed. Alicia buries the family, then puts the pictures in a jar by their graves. Charlie tells Alicia that she is like her mother, Madison. Alicia gives Charlie her sharpened, gun nozzle weapon. Her anger at the girl is gone. Alicia admits to leaving Morgan in the storm. Charlie pipes up that she's good at finding things. In the car, Alicia tells Charlie to close her eyes. She describes going to the beach. Charlie cries as she remembers her parents faces. They drive back to the mansion, no Luciana or Victor. Morgan's covered wagon is destroyed, he's also missing. They finally reach the bridge. The bus is turned over. June and John aren't there either. Alicia takes back her weapon and kills a walker. She returns it to Charlie, then says their friends are gone. Things will always get worse. Alicia and Charlie walk back to the car together. "Close Your Eyes" had me conflicted. The set-up was ridiculous. But the show needed a setting for Charlie and Alicia to bury the hatchet. The actresses, particularly young Alexa Nisenson, pulled off the rapprochement. They become a new dynamic duo. I have no doubt the remaining episodes will be of the other characters dealing with the storm, then somehow coming back together. 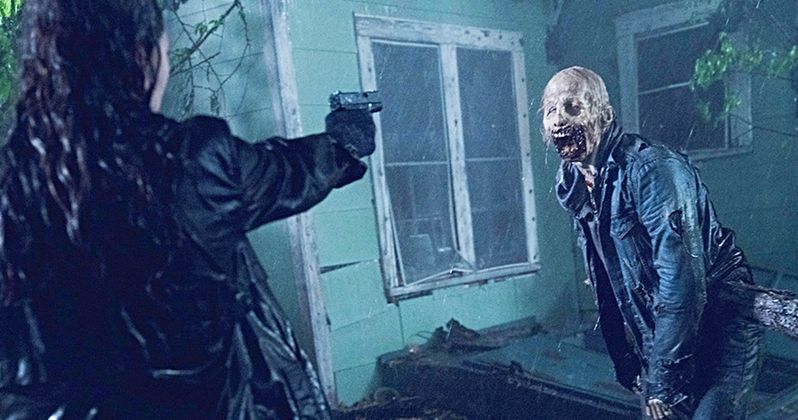 The Walking Dead and Fear the Walking Dead continuously depends on unnecessary separation and reconnection. It's lazy storytelling. I pray AMC mixes it up next week with Morgan's episode.